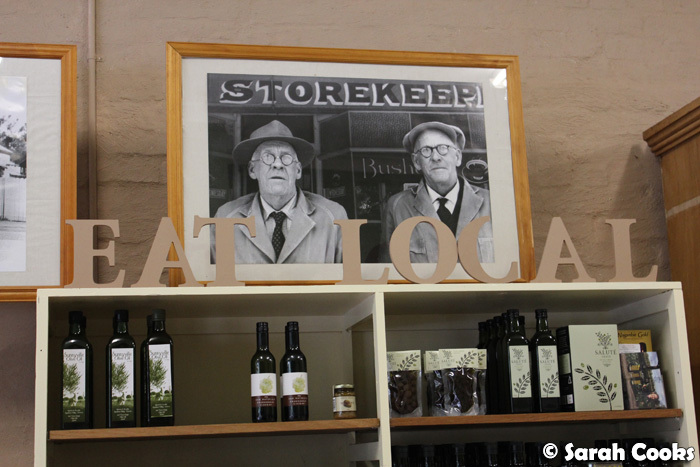 At the start of March, I was invited by Goulburn River Valley Tourism to discover the region from a food lover's perspective, visiting cafes, produce stores and restaurants. I was also lucky enough to be put up in some lovely accommodation! (Blogpost to come.) The Goulburn River Valley region encompasses quite a large area, from Wallan, Kinglake, Marysville and Lake Mountain in the south, up through Seymour and Nagambie, all the way up to Shepparton and Mooroopna in the north. (See the Holiday Planner for a proper map!) Prior to this trip, I wasn't familiar with the area at all, and really appreciated the opportunity to discover a new region. My itinerary focused on some of the towns up north off the Hume Highway: Murchison, Kialla West, Shepparton East, and Euroa. First stop was Wagner Bros Fine Food Store in Murchison. 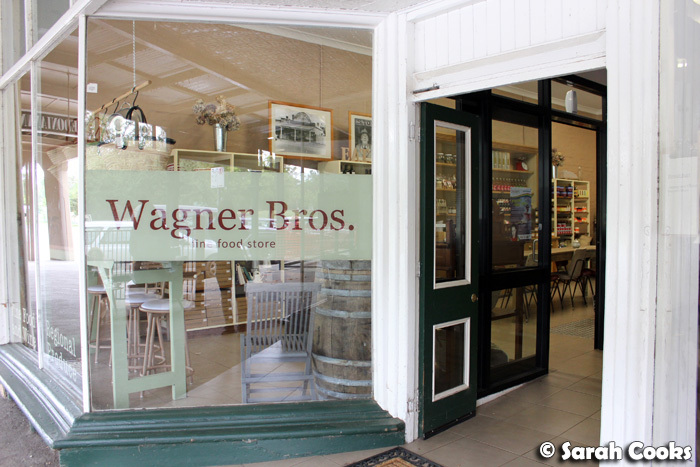 Wagner Bros is a cafe-slash-food store, run by the lovely Alice. 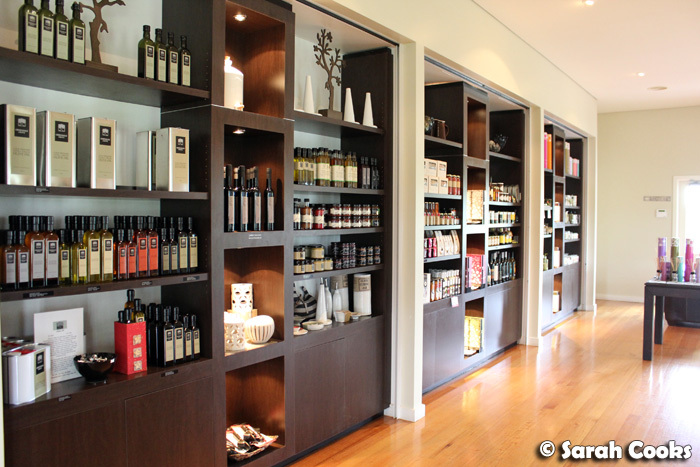 It's been open in its current format for two years now, and specialises in local produce and wine, including Ruffy Produce relishes, Nagambie Gold olive oils, Locheilan cheeses and more. They've also recently expanded to do weekend breakfasts - eggs, muesli, toasties, French toast, that sort of thing. As it was a weekday, no brekky for us, but we did have a coffee, much needed after the early-morning two hour drive from Melbourne! I was really impressed by the latte - at the perfect temperature, strong and rich, without being overly bitter. Alice says she and her staff were trained by Shingo Fujimoto, a Japanese coffee expert based in Shepparton. 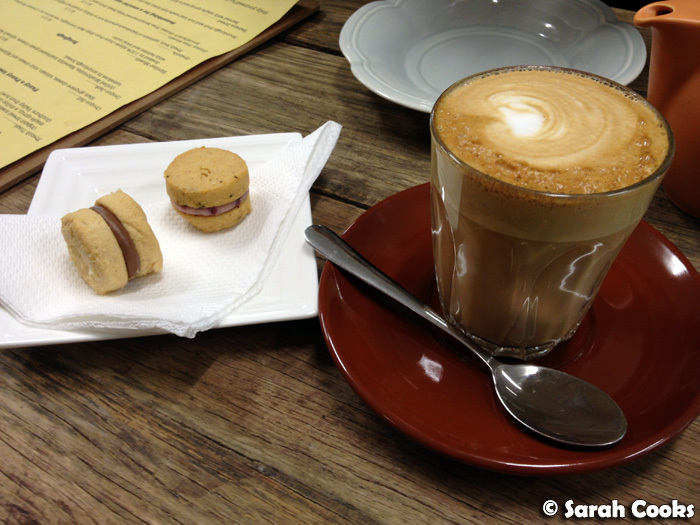 The coffee also came with a couple of delicious bonus biscuits from Michel's Fine Biscuits of Castlemaine! (Emphatically not connected at all to the Michel's Patisserie chain, of which I am most certainly not a fan!) I love Michel's biscuits - especially their white chocolate pistachio variety, which I used to practically inhale when I worked in a store selling them, many years ago! I liked the concept of the space - Alice described it as trying to create a 'home away from home', with half the space representing the "Kitchen", and the other half representing the "Lounge Room". Cute, right? Alice kindly gave me a little hamper of goodies to take home, which I've been busily cooking and baking with since I got back. In fact, all of the produce stores I visited were keen to show off their great local products and very generous in making up hampers for me. It'll take me a little while to work my way through it all, but I'm looking forward to sharing my cooking and baking adventures with you over the next few months! I'd love to come back to Murchison on a weekend to try out Wagner Bros' breakfasts - just as soon as I can round up some friends willing to do an early morning drive! 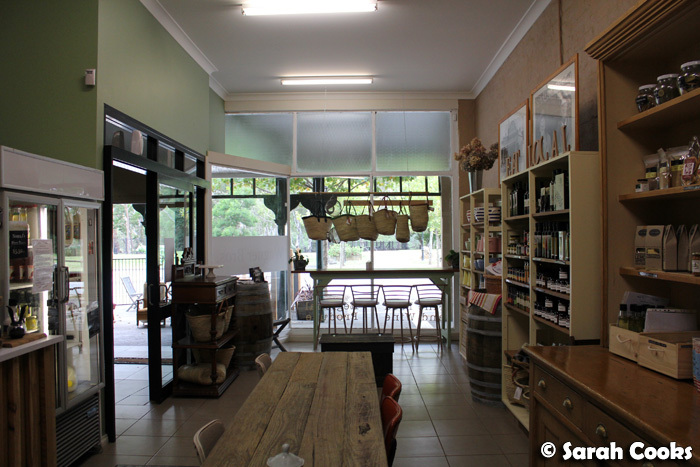 Next on the itinerary, we headed to Kialla West, for the Greendale Grove Olive Shop. 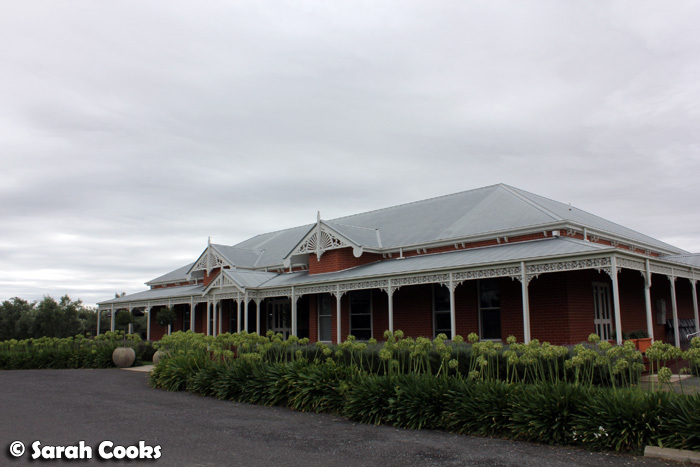 Housed in this gorgeous old building, the Greendale Grove Olive Shop sells a great range of gourmet foods made from the olives grown on the estate, as well as other local fare and olive-based body products. In fact, the range of body products was so vast, I felt like I was in an olive day spa! 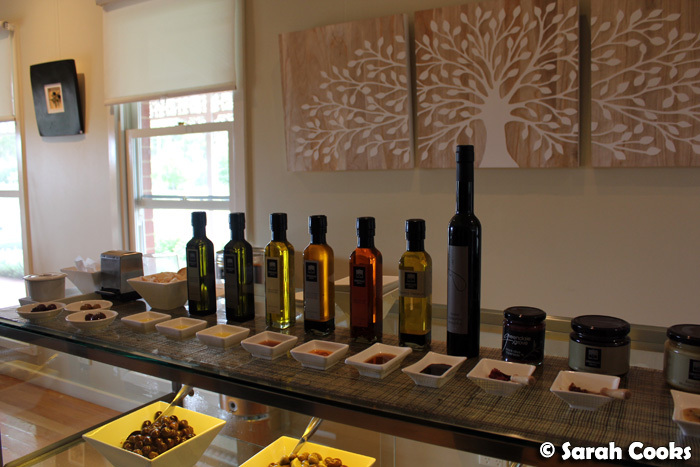 Tastings of their oils, dressings and olives are also available. My favourite here was the chilli-infused olive oil, which really packs a fiery punch! We were generously given a bottle to take home, and have been using it in everything: pastas, stir-fries, marinades, salad dressings... if anyone has any ideas for using chilli oil, do let me know! In the same building as the shop is the Olivehouse restaurant, where we stopped for a spot of lunch. (Disclosure: I paid for the lunch myself, but we were comped a serve of bruschetta). The menu comprises a mixed bag of dishes, with no clear single influence - for example, chicken masala curry, roasted vegetable panini and braised lamb shanks all make an appearance. (This tends to be a warning sign for me!) Prices for mains range from $19.50 for a chicken salad, up to $39.50 for a wagyu sirloin. 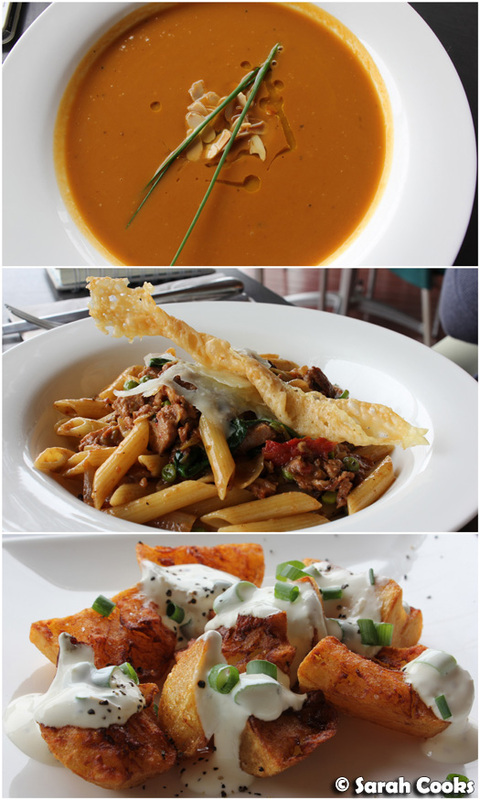 We ordered a roast pumpkin and sweet potato soup, a sausage pasta, and a side of deep-fried potatoes with garlic cream. Whilst the dishes that we ordered were perfectly pleasant and tasty, they weren't anything special - in particular I would have preferred it if the fried potatoes had been served hot and crispy. 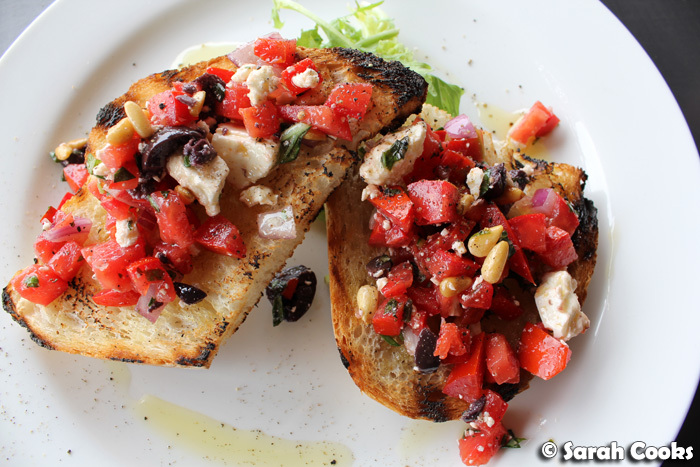 However, the bruschetta was absolutely fantastic! The bread was lightly chargrilled, with a generous drizzle of olive oil, becoming crispy and light in the process. The topping included lovely fresh tomatoes, black olives, feta cheese and pine nuts - so delicious! Our waitress told us that the bread comes from the 'Golden Star Hot Bread' bakery on Vaughan street in Shepparton. I would have loved to go and pick up a few loaves, but unfortunately we didn't get time on the trip to visit the bakery itself - I'll have to remember it for next time! Based on our experience, I'd definitely suggest ordering dishes that showcase Greendale Grove's produce, like their bruschetta, their produce plate, or the antipasto. 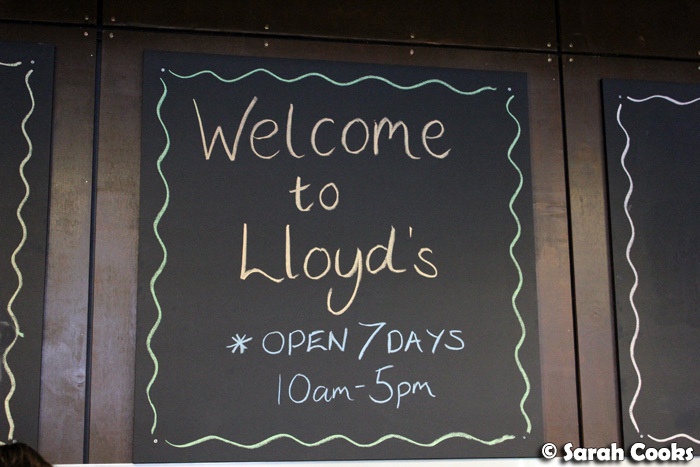 A short drive from down the Goulburn Valley Highway was Lloyd's Produce Store. Lloyd's Produce is located within the Emerald Bank Leisure Land complex, which also includes Pot-Werx (with "Victoria's largest range of pots" - did you read that mum? ), the Riverside Gardens Nursery, the Windmill Chocolate Shop and Cafe, the Shepparton Motor Museum and an Adventure Park. 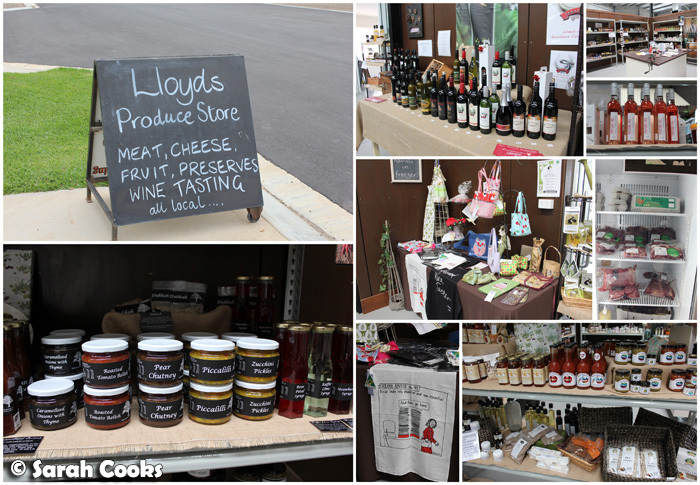 Lloyd's Produce is a gourmet store, selling a wide range of local produce: wines, meat, cheese and interesting preserves and relishes. One thing I liked about this store in particular was that they had a great selection of items unique to the region, things that I hadn't seen in Melbourne before. My favourite item here was the intriguing Mimi's Basil Cordial, handmade in Murchison. I thought it might taste like pesto, but it actually had a very mild, slightly floral flavour. Owner Emma generously gave us a bottle to take home as part of a hamper, and we've been drinking it with soda water and gin - lovely! Lloyd's also often do interesting little events, like information sessions on gluten free food, and even yabbie races for Australia Day! After our visit, she told me that she set up a Twitter account for Lloyd's, based on our discussion. So does that mean I can call myself a "digital marketing consultant to the food industry?" Because that's totally going on my resume! After Lloyd's, we drove to the Chocolate Apple Factory, in Shepparton East. And look who we met in the parking lot! Awww...! 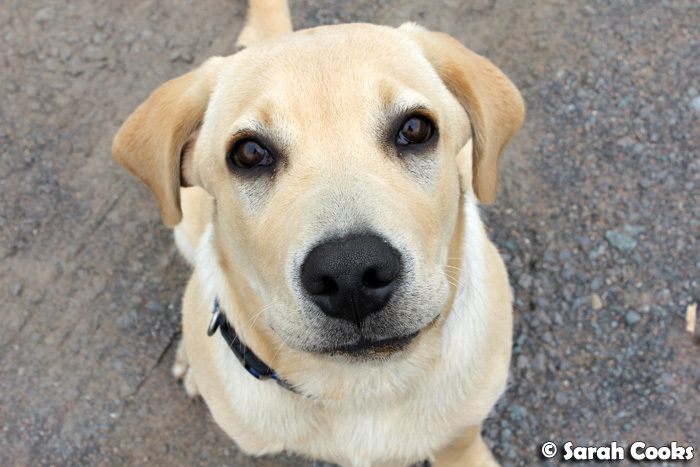 This adorable little fella is called Cooper, and he was so super friendly! 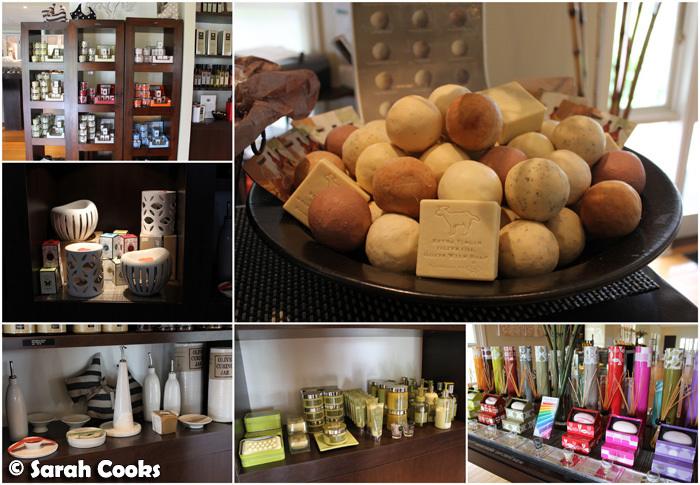 At the factory shop, you can buy a range of local pantry items, as well as liqueurs, chocolate pralines, and the famous chocolate apples. 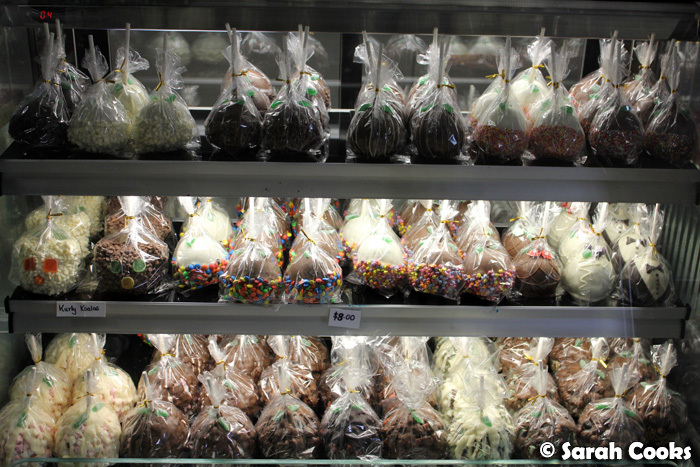 Owner Vera uses a mixture of Nestle and Cadbury chocolates to make her range of sweet treats. 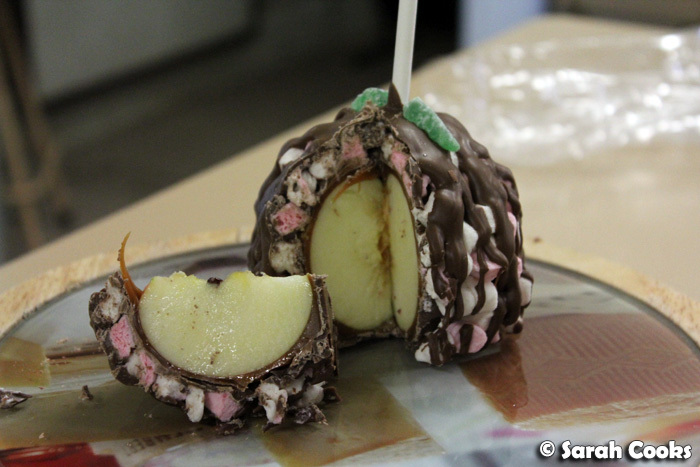 We tried their most popular variety, the Rocky Road apple ($10), which was coated in caramel, chocolate and marshmallows. The idea is a lot of fun, and I know kids would love them, but I must admit I found this variety too sweet. What I did love, however, was their range of juices. They do 'single origin' juices, including Granny Smith, Pink Lady etc., and I was surprised to taste a big difference between the various juices. 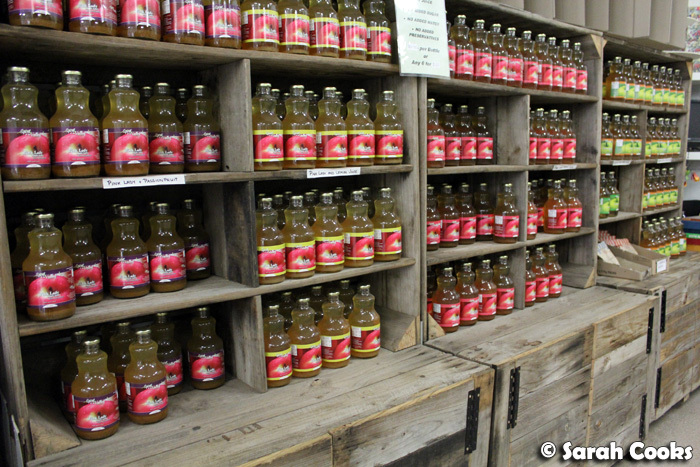 My favourite was the Pink Lady, and we purchased a couple of bottles to bring home. 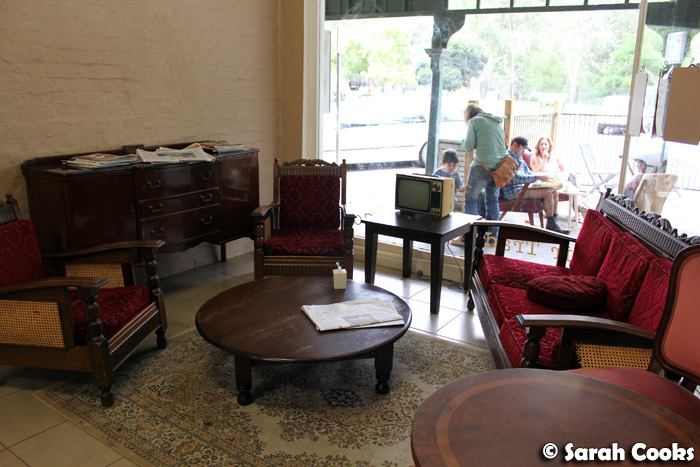 In the next post: the accommodation - The Euroa Butter Factory! Sarah and Sandra visited the Goulburn River Valley as guests of Goulburn River Valley Tourism. This is the first post from my Goulburn River Valley Trip series. I love Locheilan cheese! So much so that I've taken the work car down unpaved roads on more than one occasion to purchase it straight from the source. I have a great 'small world' story about the cheesemaker, too, which I'll share the next time I see you.